The studs have been tested by Ceram and all the Tactile Paving Services Limited tactile paving stainless steel studs have passed the slip test in both wet and dry conditions. 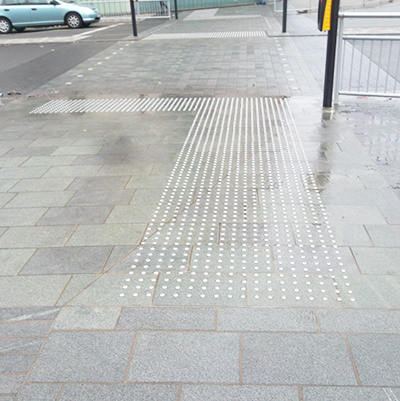 Tactile Paving is a system of textured ground surface indicators found on many footpaths, stairs and train stations platforms to assist blind and vision impaired pedestrians. Tactile warnings provide a distinctive surface pattern of "truncated domes" or cones which are detectable by long cane or underfoot which are used to alert people with vision impairments. The relatively high cost of having bespoke blister paving manufactured in a stone to match or complement other stone paving in the vicinity has resulted in the use of retro fixed studs that are affixed to standard paving units. The studs are fixed by drilling the paving and gluing into position. This is the most common type and features Tactile Studs in a square pattern at 67 mm spacing. These are often used to indicate pedestrian crossings with dropped kerbs. A minimum at 800mm area should be covered with Tactile studs away from the edge of the kerb.